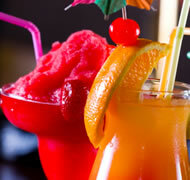 You supply the spirits, we supply the fresh fruity mixers. With all our Cocktail Recipes we recommend 1 bottle of spirits to taste. A very popular cocktail … sweet and blue. Keeps you going all night long … you wish! Add lemonade, Blue Curacao liquer essence and Red Bull. Frozen, fruity Vodka flavour with delicious guava colour. Fantastic fruit flavour with an exciting Cariibean white rum taste. Rich smooth and creamy. You could drink them all night. Kahula and creamy white chocolate taste … mmmmm. 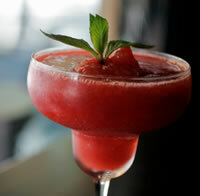 The Daiquiri is a very popular old favourite. An ice strawberry taste with the smoothness of White Rum. Wow!! Real fruit tingle flavour and a fabulous deep purple colour. Fresh pineapple juice, coconut and a tang of orange.